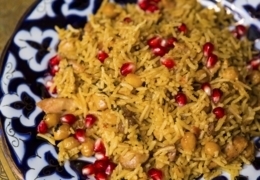 We dine out frequently and often times for persian cuisine. This was the worst persian food we have ever had and all to top it off service with an attitude. The waitress was sour from the moment we entererd. She was yelling at her mother in the kitchen about being hungry. Not exactly something a customer needs to hear. We ordered a dish called Barg which by the traditional recipe is made with tenderloin. When the meal arrived the meat was very dry and obviously not tenderloin. Rice too was very dry and the bread was stale. We had to go up to the waitress that never bothered to come back and tell her we how dry and tough the meat was and we said "this is not tenderloin" and she said that they use sirloin. She asked if we wanted anything else and seemed very unconcerned . Never even appologised or tried to offer an alternative. We opted to leave and vowed never to come back. Bad food and service with an attitude are a recipe for disaster for any retaurant. 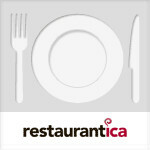 Excellent food! A group of persian, and non-persian friends all loved the food. Fresh and tasty. Friendly staff. Absolutely amazing food and really relaxed atmosphere. We went with 5 friends and everyone liked it. The the hosts was friendly and helped us select the dishes. I particular I like dthe chelo kebab and the fresh promegranate juice. highly recommend it. Quite possibly the cutest Persian restaurant I’ve been to in Toronto. Darbar is the perfect place to lunch or dine solo, or with companions. The space is cozy and small, and doesn’t tend to get too crowded. It’s great for those who want an intimate, quiet evening out. The homey, cultural decor and soothing piano music (including Persian tunes) will make you feel at ease while you enjoy their authentic Persian dishes. The lamb skewer is cooked to a juicy perfection. For a vegetarian option, ask for the fesenjoon without chicken – a sweet and nutty pomegranate, walnut stew. To outsiders strolling Toronto’s busy Yonge Street., Darvish might not look like much, but this is how locals often claim their best-hidden secrets. 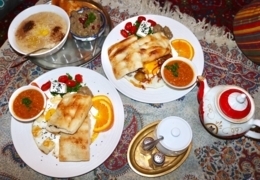 The restaurant’s authentic fare is delivered in full portions, with traditional stews, kebabs, hummus and dolmeh-barg (grape leaves filled with rice and spices) keeping appetites content.